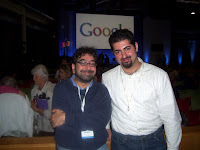 I attended Google's (GOOG) annual shareholder meeting today, May 7, 2009. As usual, the meeting took place on Google's campus. In the past, meetings were an intimate, casual affair. Larry Page and Sergey Brin, Google's founders, would sit on stools and answer shareholder questions. I loved watching these two young men up-end Santa Clara County's normally uptight corporate culture. Sergey was especially fun to watch, because if he didn't think your question or comment had merit, he'd take you on directly. During one meeting a few years ago, when a shareholder chastised Google for not doing enough to combat China's censorship, saying other companies were being more pro-active, Sergey sneeringly pointed out that Yahoo had just helped China jail a reporter. In any case, I should have known it was all too good to be true. This year, neither founder attended the meeting. The meeting took place in a larger conference hall instead of an upstairs room above the cafeteria. I suppose this development is a natural progression--more shareholders attend the annual meeting, and most companies move away from their founders as they grow. Still, I hope Sergey and Larry come to next year's meeting. It wasn't the same without the two of them sitting up there, jeans and all, ready to answer questions without a corporate-style verbal filter. I missed the lunch, which was held at 12:30PM. (I still managed to get two It's-It ice cream treats and a cold salad to tide me over). The meeting itself started at 2:00PM. David Drummond, Google's Senior VP and Chief Legal Officer (and a Santa Clara University graduate--go Broncos! ), handled the formal part of the meeting. During the formal part of the meeting, a Chinese activist [Update: his name is Jing Zhao] wanted to make some comments on a shareholder proposal relating to online censorship; however, Google's procedures do not allow ordinary shareholders to make comments on proposals prior to voting. Google only lets the shareholder who placed the proposal on the ballot to speak for a few minutes. Thus, Google acts as a partial censor at its annual meeting--at least with respect to comments that may impact how shareholders vote on stockholder proposals. Many shareholders vote their shares in person at the meeting and may be influenced by shareholder comments. Allowing ordinary shareholders to comment on proposals only after voting is closed is tantamount to the American government banning CNN from making political comments until after national election polls are closed. Google ought to limit the time a shareholder can speak on proposals to three minutes and let anyone who wants to comment specifically on a proposal have their say. This change would strike a reasonable balance between allowing activists to disrupt the meeting and restricting the flow of information to shareholders. As for the person who wanted to speak, his first language isn't English. I've seen him at other shareholder meetings commenting on stockholder proposals relating to China. He is against China's censorship policies, but his broken English makes him difficult to understand. In this case, when he wasn't given an opportunity to speak, he quietly walked out of the meeting. When he tried to speak at Cisco's annual shareholder meeting, the CEO allowed him to speak briefly. After the meeting, a Cisco investor relations representative took him outside and listened to him. Cisco handled the situation much better than Google, but I am confident Google will learn from this experience. 1. There is no recession in information. 2. Google is making advertising ridiculously easy. During the Q&A session Mr. David Drummond talked about censorship as being bigger than just China. He said it also took place in non-authoritarian countries. In a really interesting comment, he said that police have visited Google in the middle of the night because Google would not share information. He later mentioned Germany and France as two non-authoritarian countries that apparently engage in some censorship. A shareholder asked about company morale now that Google's "legendary" perks have been reduced. CEO Schmidt said Google still had amazing perks, including fifteen(!) food options/cafeterias. Mr. Schmidt is correct--Google still has fantastic perks, and the perks aren't limited to tangible items. A casual stroll through Google's offices shows that employees have the freedom to do pretty much anything. One employee, Mr. Tan Chade-Meng, has pictures with lots of famous speakers posted outside his office, and most Google employees decorate their work space as they see fit. I saw a bunch of international flags, stickers from different American states, and even pictures promoting a pirate club. Google even has on-site medical doctors who can prescribe medication, so no employee has to go to the hospital unless something really serious happens. Of course, Google employees still get free food, soft drinks, coffee, and massages (Google gives massage certificates to employees on their birthdays). Google employees may also bring a friend twice a month to the cafeteria for a complimentary meal. In short, I wouldn't worry about Google's employees. They are expected to work hard and are allowed wide latitude as long as their work gets done. Another shareholder asked Google not to split its stock. He was concerned with market manipulators and short sellers. Other shareholders commented on how to improve various services, especially Google's language translation tools. Overall, Google's shareholder meeting was well-done, but not a great experience. It almost felt like the company had matured into just another big corporation. Many shareholders fell in love with Google because of Larry and Sergey's vision. Without them at the meeting, Google risks having a so-so shareholder meeting instead of an annual event on par with Berkshire Hathaway, Apple Inc., and other wonderful companies. Bonus: here is Eric Savitz's take on the meeting. The picture above is of Eric and me. For those of you who follow his blog, he seems like a really cool guy. Audiocasts of annual meetings are here. Video of the annual meeting is here.